we must look at ourselves with the strictest eyes. Shotokan Karate of America conducts regional special practices known as "Special Trainings" twice a year, usually in the winter and summer. These are the most important events for any karate student, for they allow one to push oneself to one's limits through intensive training periods from three to four days in duration, with several practices each day. Many students agree that Special Trainings are the most demanding and strenuous mental and physical experiences of their lives. The individual is given the opportunity to train with a large number of members of all ranks from many dojos, who gather to increase their self-awareness through this rigorous training. The event is usually held in a large facility such as a private boarding school where students all share the common experience by living, eating, and training together. Separate facilities are always provided for men and women students. Special Training represents an opportunity for the serious karate student to advance himself both mentally and physically. No drinking, taking of drugs, or sexual activity is tolerated. 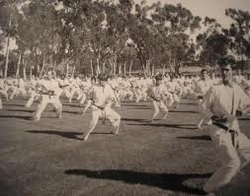 In line with the martial arts tradition of "what you begin you must finish," one may not leave Special Training until it is officially over without the permission of the chief instructor. Any student who breaks this rule automatically loses his membership in SKA, and will never again be allowed to practice with any SKA dojo. There is absolutely no exception to this rule. Special Training has come down to us from martial artists of the past who sought a way to put their mental and physical powers to a test by calling upon their innermost strengths--strengths that you will realize you also possess after this intensive training experience. Indeed, to put ourselves into hardship, to push ourselves to our physical limits and thereby to strengthen our mentality, and to see ourselves with clearer eyes are the ultimate goals of this practice. "We know that human beings are very kind to themselves and are living as easily as they can. In this kind of situation we only maintain what we have, and the only way to obtain something new is to push ourselves strongly forward. The purpose of practicing karate is to develop physical and mental strength by putting ourselves into hardship."